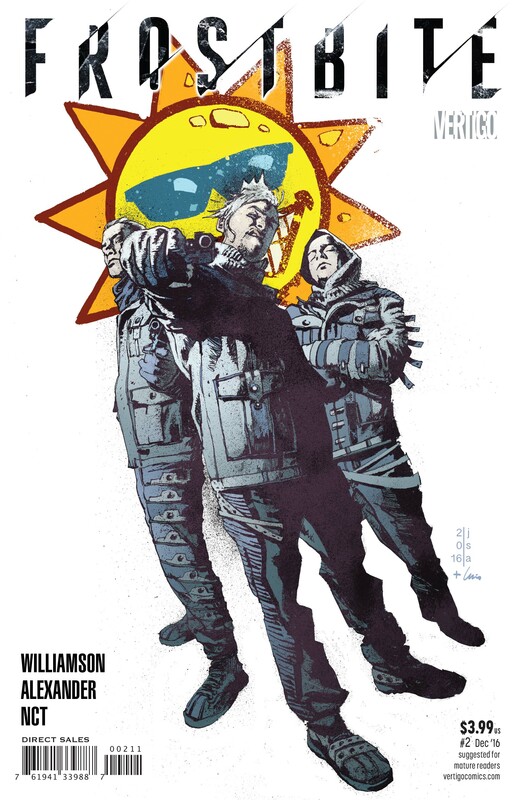 The second issue of Joshua Williamson and Jason Shawn Alexander’s Frostbite sees Keaton and Barlow trying to secure transportation to transport their valuable cargo – scientist’s daughter Victoria, who may have discovered a cure for the titular disease – out of L.A. to Alcatraz. As you might expect, things don’t exactly go smoothly, and the trio run into a fairly sizeable roadblock. This second issue doesn’t necessarily have the morally ambiguous gut-punch of the first, but Williamson does his best to try and keep the early momentum going as we get to find out a little more about our characters and the world they inhabit. The dynamic between Keaton and Victoria is clearly going to be the driving force for the series as it moves forwards, and while it’s a little uneven for the time being, there are certain moments – particularly any time Vic mentions her father – that really ramp up the sense of awkward tension. Williamson also throws in an interesting wrinkle to Keaton’s story that frames the whole story – and her shocking actions in the previous issue – in a whole new light. At the same time, Barlow still remains almost painfully one-dimensional, with no real sense of personality or motivation beyond trying to help the ‘mission’, which is a disappointing flaw in such a relatively small cast of characters. Jason Shawn Alexander’s visuals are once again impressive, giving everything a scratchy, grainy quality which plays well alongside the post-apocalyptic vibe of the series. Luis NCT deserves additional praise for his colour work too, giving a book a washed-out feel with plenty of greys, whites and light blues helping the reader to feel the chill in the air as Keaton and co. try to make their escape. Alexander’s skill makes the previously mentioned ‘wrinkle’ land even more emphatically, and the brief flurries of action are illustrated clearly and dynamically for the most part. That said, aside from one key storyline beat, there isn’t really much going on in this issue, and while there’s a little bit of conflict along the way, it doesn’t really play into the larger story and – ultimately – feels a little inconsequential as a result. After an incredibly strong opening chapter, things take a noticeable step back here, leaving Frostbite balancing on the precipice of becoming just another post-apocalyptic science fiction book. However, with Williamson and Alexander at the helm, I’m supremely confident that the ship will be able to quickly right itself, and that we’ll be back to capitalising on this fascinating premise again before too long.